It is with great pride and excitement that I welcome you to the 2018-2019 school year as your new principal at Oakwood Elementary. I am filled with honor to have the opportunity to lead a school with such a rich tradition of success. I have dedicated myself to the field of education for the last 13 years. I have worked in a variety of roles during this time including coaching, teaching, and serving as a principal at all three campus levels. 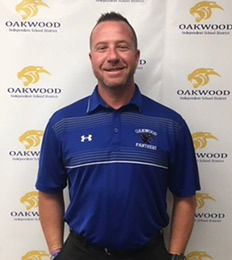 At Oakwood, I will also be serving as the leader of Fellowship of Christian Athletes (FCA) and head baseball coach, restoring a program that has been without a team for more than a decade. Along with the teachers and staff, I will work hard to continue the success established at Oakwood by building strong relationships with parents, students, and community partners. We will focus on character education initiatives, collaboration, the use of data to drive instruction, and to provide consistent implementation of the curriculum in a rigorous manner so that we can continue to increase all of our students' achievements. I am married to my wonderful wife Renee. We have four boys: Justice (20), Garret (17), Braden (13), and Easton (6). Needless to say, there is never a dull moment around our house! We enjoy all sports, traveling, and cooking for all our family and friends. We also have a strong passion for serving the community through ministry and the mission field. We are very active in our church (Evangelistic Temple) along with the Fellowship of Christian Athletes. Although I am a proud graduate of Stephen F. Austin State University, my wife along with our oldest boy are Texas A&M Aggies, so we definitely bleed maroon. All of us at Oakwood Elementary are eager and excited to begin what promises to be the best year ever. This year is going to be amazing as we continue to provide academic and extracurricular experiences for our students that are rigorous, relevant, and help them build relationships while making real-world connections. I look forward to working with you as a team to help each student at Oakwood Elementary meet his or her goals and have a successful school year!